Maria Rocha, a third-grade teacher at the KIPP Esperanza Dual Language Academy in San Antonio, came to the U.S. from Mexico when she was 3 years old. As a DACA recipient, Rocha says that she had a somewhat normal life before the Trump administration. Maria Rocha helps a student with the morning warm-up in her third-grade science class. Rocha checks her student's work during her third-grade science class. Rocha says she's thought about quitting her graduate studies. "Why continue to work if my work permit is going to expire? But no one is ever going to un-educate me." Of the 690,000 undocumented immigrants now facing an uncertain future as Congress and President Trump wrangle over the DACA program are about 8,800 school teachers. The real possibility that they'll be deported if the Deferred Action for Childhood Arrivals program is allowed to expire has put enormous stress on them. Maria Rocha, a teacher in San Antonio, Texas, says it's gut wrenching, but she's trying not to show it in front of her third-graders. 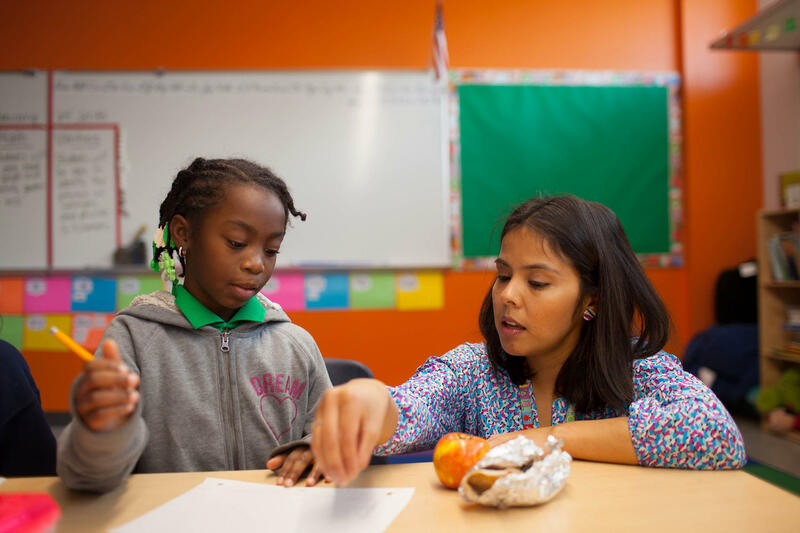 Rocha has been teaching at KIPP Esperanza Dual-Language Academy for three years. 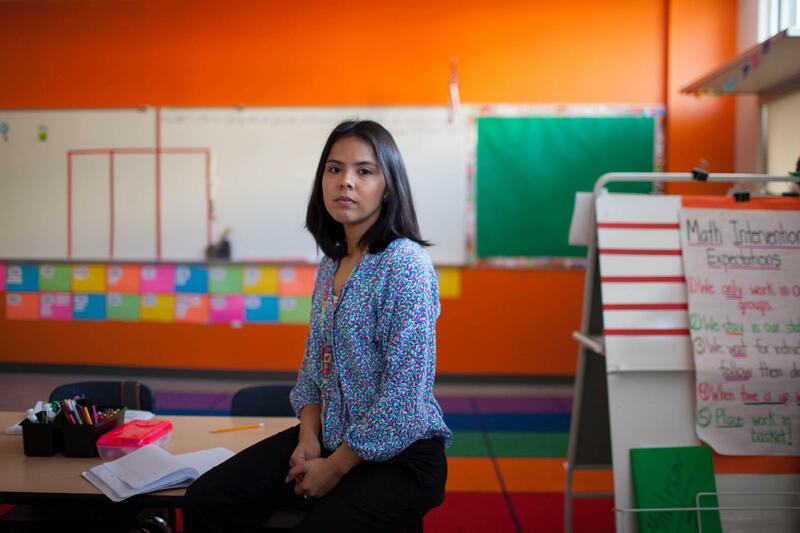 It's even harder, she says, because some of her students are also at risk of being deported. "It's a very touchy subject with 8-9 year olds," says Rocha. "But they're aware of this because they have family members who are undocumented themselves, so their families talk about it." Rocha says a first-grade teacher and colleague at the school self-deported late last year after her DACA permit expired. Everybody at the school took it really hard, says Rocha, but there was nothing anybody could've done. 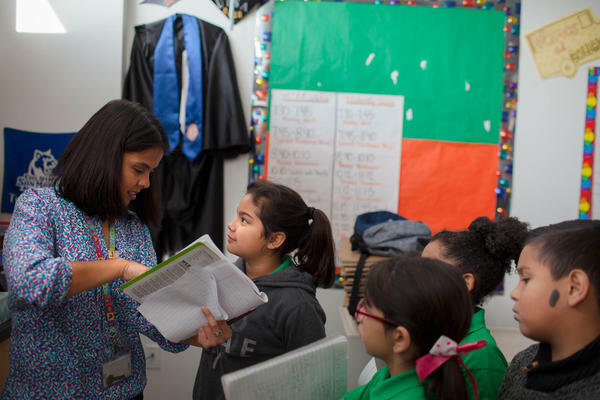 School districts in Texas and across the country have hired teachers covered by DACA on the condition that they renew their work permit every two years, as the program requires. But last September, after President Trump announced he was shutting down DACA, these teachers suddenly found the safety and security the program had offered up in the air. 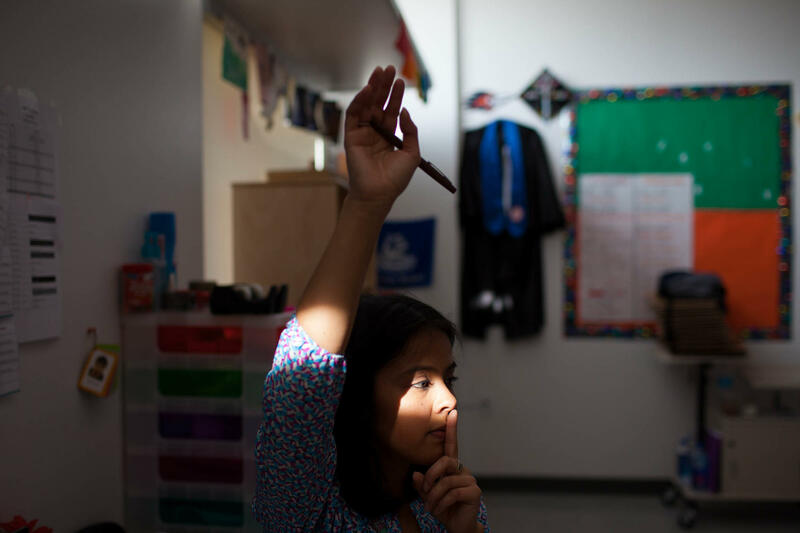 "I'm trying to remain positive and try to compose myself every day with my students, Rocha says, "because I talk to them about their future and yet I don't know my own." Rocha was a toddler when she and her grandmother left Coahuila, Mexico, and entered the U.S. illegally. In June 2012, right around the time Rocha turned 25, DACA went into effect. Rocha qualified and immediately her life changed. "I was living in the shadows because of fear," she says. 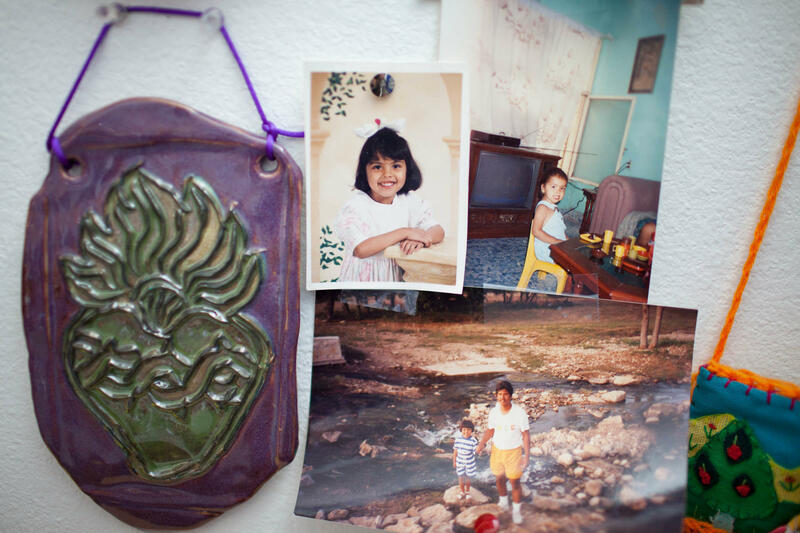 "I didn't want my family targeted because they're also undocumented. But with DACA I was no longer afraid." Before then, Rocha had been working as a housekeeper while holding down two other jobs to pay for her college education. When she graduated with a teaching degree from the University of Texas-San Antonio, it was the fulfillment of a childhood dream — to be a teacher. "I just purchased my first car in December," says Rocha. "We've done things the right way. We were told to go to school, make a career. But now we're at the mercy of the stroke of a pen." Simon Sandoval-Moshenberg of the Legal Aid and Justice Center, an advocacy group in Virginia, says that if lawmakers don't restore DACA, Rocha and people like her will be forced to recede back into the shadows. "We're talking about huge numbers of people with work permits, who've built a solid working class or middle class existence," he says, "who will immediately be punched into poverty." Some legal experts say the courts could still intervene. Teachers unions and the National School Boards Association for example are backing a lawsuit filed last month in New York that could prevent school districts from firing teachers whose DACA permits expire. Maria Rocha says she survived before DACA and she'll survive after DACA. "Mama dice que es ser bendecida," Rocha says in Spanish: My mom says I'm blessed, because of DACA. Now, the question is, will lawmakers in Washington see it that way? When President Trump gives his State of the Union address tonight, many people will be listening for what he says about DACA. That's the Deferred Action for Childhood Arrivals program the Obama administration created for immigrants who came to the U.S. as young children. The Trump administration plans to end the program unless Congress steps in, which means nearly 700,000 DACA recipients don't know what their status will be. About 9,000 of these are educators and teachers. NPR's Claudio Sanchez reports. CLAUDIO SANCHEZ, BYLINE: Maria Rocha says it's gut-wrenching not knowing whether she'll have to leave the U.S., the only home she's known. But she's trying really hard not to show it in front of her third-graders at Esperanza Elementary, a charter school in San Antonio, Texas. MARIA ROCHA: And it's a very touchy subject to talk about with 8 and 9-year-olds. But some of them are aware of this because their families talk about it. You know, their family members are undocumented themselves. And they're very aware. SANCHEZ: According to the Migration Policy Institute, Rocha is one of 8,800 teachers in Texas and across the country who were hired on the condition that they renew their work permits every two years, as the DACA program requires. But last September, when President Trump shut down DACA, people were not allowed to renew their work permits and thousands have since lost their protected status. Rocha says she knows of at least one fellow teacher who self-deported once she became illegal again. Everybody at the school took it really hard, says Rocha. And now that she's facing the same fate it's hard staying upbeat, especially in front of her kids. ROCHA: I just try to compose myself every day with my students because, you know, I talk to them about their future and yet I don't know my own future. SANCHEZ: Rocha was a toddler when she and her grandmother left Coahuila, Mexico, and entered the U.S. illegally. Rocha qualified for DACA right around the time she turned 25. Her life immediately changed. ROCHA: I was living in the shadows, you know, because of that fear and because I didn't want to put my family - a target because, you know, they're also undocumented. And - but with DACA I was no longer afraid. SANCHEZ: Up until her mid-20s, Rocha had been working as a housekeeper while holding down two other jobs to pay for her college education at the University of Texas, San Antonio, where she earned a teaching degree. It was a fulfillment of her childhood dream to be a teacher. ROCHA: You know, we've done things the right way. We were told to go to school. We were told to make a career out of our future. And we're doing so. And now we're being juggled. It's very sad. SANCHEZ: Simon Sandoval-Moshenberg of the Legal Aid and Justice Center (ph) in Virginia says if DACA dies Rocha and many people like her will be forced to recede back into the shadows. SIMON SANDOVAL-MOSHENBERG: We're talking about huge numbers of people who have managed to build a sort of solid working-class existence, if not in some cases middle-class existence, who are going to be immediately plunged into poverty. SANCHEZ: Some legal experts say the courts could still intervene. Teacher unions and the National School Boards Association, for example, are backing a lawsuit filed last month in New York that could prevent school districts from firing teachers when their DACA permits expire. But no matter what happens, Rocha says she survived before DACA and will survive after DACA. SANCHEZ: Rocha says her mother always reminds her, you've been blessed because of DACA. The question is, will lawmakers in Washington see it that way? Claudio Sanchez, NPR News.